St Luke's Blog: "They're not pets, Susan." 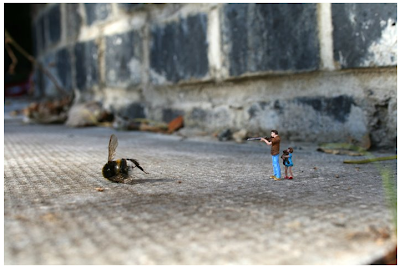 Slinkachu is an anonymous street artist who leaves little people around cities to fend for themselves. It reminded me of the School of Life's experts in jars. His blog is brilliant! "Policeman: Excuse me, sir. Would you mind telling me what you're doing? Slinkachu: Oh. Er. . .I was just gluing down this little plastic person. Slinkachu: Here, look. It's an. . .er. . .an art thing. Kind of. I take photos of these little people. Then I leave them. Policeman: Oh, ha! Cute! Sorry, I though you were sniffing glue, what with that superglue. We get a lot of that around here. Slinkachu: Yeah. Ha. . .
Policeman: Yeah, this is cute. Ha, a little car too! Sweet. My kids would love this! Slinkachu: Yeah. . .It's, er. . .a little prostitute. And a punter. In the car. Policeman: Oh. . .well, er. . .carry on. an ex-stluker called jason gormley makes art with these figures. i remember him excitedly showing me a match head sized head of a planet of the apes character saying "look al, it's Galen". Ooh that's really handy information. I love this idea. We could definitely do something with it for School of Life.